Offering a <1mVrms output signal noise and 3.5 ms input/output delay, Penny + Giles’ SRH220DR dual redundant output contactless rotary position sensor range has been extended with the addition of a 0 to 10 V output version. Available in a choice of integrated 6-way connectors, it provides numerous factory-programmed options. Designed for operation in arduous environments (-40 to 115 °C), the rugged sensor enables system designers to quickly and easily improve the safety and integrity of control systems by using the dual independent power supply and output signals, which allows compliance with SIL-2 requirements for systematic safety as defined in IEC 61508. Providing numerous parameter options including measurement range and clockwise or anticlockwise direction output, it suits applications in factory automation systems and process control machinery. Operating from an unregulated 13.5 to 30 Vdc power supply, the configurable rotary sensor is available factory-programmed with any one of 341 different angles from 20 up to 360°, in one degree increments. It also provides 12 bit resolution (0.025%) over the selected measuring range. Unlike conventional shaft-operated rotary position sensors, the device has an integrated shaft and magnet assembly that activates the Hall effect sensor through a hermetically-sealed chamber. This allows the sensor to be used in extreme environments that are subjected to high shock and vibration, and endure immersion in fluids for short periods (IP68 protected). The sensor’s molded housing includes a crush-proof mounting flange detail, which has stainless steel inserts, allowing fitting and re-fitting of the sensor without damage to the flange. 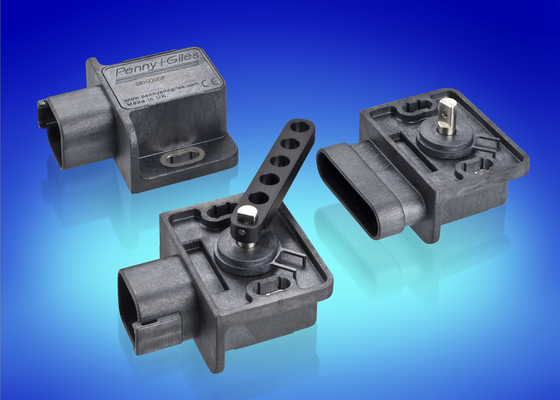 The integrated 6-way connectors are compatible with AMP Superseal 1.5 or Deutsch DT06 profiles. The sensor can also be factory programmed to offer 0.1 to 4.9Vdc output range, matching the equivalent signals from a potentiometer and the two outputs can be used for error checking, if they are set up to be opposed (clockwise on the first signal and anticlockwise on the second signal) and the output summed. Factory-configured options also include analogue (0.5 to 4.5Vdc) or PWM digital signal outputs as standard. The sensor features electromagnetic immunity to 100V/m and its very low maximum output signal noise means that no additional signal filtering is required on the output signal. It also has a non-linearity of ±0.4% and, when powered with 5Vdc regulated supply, has an operating temperature range from -40 to +140ºC, with a stability of less than ±30ppm/ºC. An optional lever arm kit can be supplied.